Unmanned instrumented probes obtain scientific information about the moon, other planets, and the space environment. Probes are differentiated from sounding rockets in that they attain at least 6400-kilometer altitudes. When a probe is launched on an escape trajectory-attaining sufficient velocity to travel beyond the earth's gravitational field-it becomes, in effect, a satellite of the sun. The Lunar Orbiter probes, however, were sent into orbit around the earth's natural satellite, the moon. In May 1960-at the suggestion of Edgar M. Cortright, Assistant Director of Lunar and Planetary Programs-NASA adopted a system of naming its space probes. Names of lunar probes were patterned after land exploration activities (the name "Pioneer," designating the early series of lunar and related space probes, was already in use). The names of planetary mission probes were patterned after nautical terms, to convey "the impression of travel to great distances and remote lands." Isolated missions to investigate the space environment were "assigned the name of the mission group of which they are most nearly a part. "3 This 1960 decision was the basis for naming Mariner, Ranger, Surveyor, and Viking probes. U.S.-German Helios 1 solar probe on the spin table for system test and checkout before mating to the Titan III launch vehicle. The project was designated "Helios," the name of the ancient Greek god of the sun, by German Minister Karl Kaesmeier. 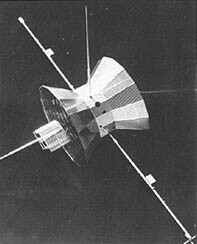 The name had been suggested in a telephone conversation between Minister Kaesmeier and Goddard Space Flight Center's Project Manager, Gilbert W. Ousley, in August 1968.2 NASA had previously used the name for the Advanced Orbiting Solar Observatory (AOSO), canceled in 1965, which was to have performed similar experiments.3 The Helios probes were to be launched on Titan III-Centaur vehicles. NASA launched West German-built Helios I into orbit of the sun 10 December 1974. 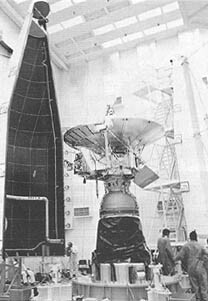 Helios-B was scheduled for 1976 launch. Scale models of a Lunar Orbiter spacecraft and the moon in top photo demonstrate the approach to within 48 kilometers of the lunar surface. Below, a portion of the first closeup of the lunar crater Copernicus, taken 23 November 1966 by Lunar Orbiter 2. Mariner 9 spacecraft with thermal blanket covering the retro engine at top. Nix Olympica gigantic volcanic mountain on Mars, photographed by Mariner 9 in January 1972, above [right]. Mariner 10 photographed the densely cratered surface of Mercury on 29 March 1974, at 18 200 kilometers from the planet. Mariner spacecraft made a number of record-setting missions, from the early years of the project. On 14 December 1962 NASA's Mariner 2 came within 34 900 kilometers of Venus, climaxing a four-month space flight that provided new scientific data on interplanetary space and Venus. On 14 July 1965, after seven months of interplanetary flight, Mariner 4 took the first close look at Mars from outside the earth's atmosphere, returning high quality photographs and scientific data. On 19 October 1967 Mariner 5 flew within 4000 kilometers of Venus, obtaining additional information on the nature and origin of the planet and on the interplanetary environment during a period of increased solar activity. 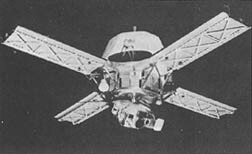 During 1969, Mariner 6 and 7 continued the investigation of the Martian atmosphere, flying within 3500 kilometers of the planet. Following the unsuccessful Mariner 8 launch attempt,* Mariner 9 was launched 30 May 1971 and put into orbit around Mars on 13 November 1971-the first man-made object to orbit another planet. 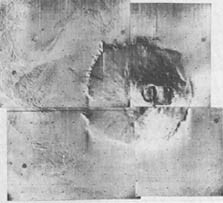 Mariner 9 photographed the moons of Mars, mapped 100 percent of the planet, and returned data proving it was geologically and meteorologically alive. Mariner 10, launched 3 November 1973, flew past Venus in February 1974 to a March 1974 encounter with Mercury, for the first exploration of that planet. The spacecraft's trajectory around the sun swung it back for a second encounter with Mercury in September 1974 and would return it for a third in March 1975. Venus data gave clues to the planet's weather system, suggested the planet's origin differed from the earth's, and confirmed the presence of hydrogen in its atmosphere. Mercury data revealed a strong magnetic field, a tenuous atmosphere rich in helium, a cratered crust, and possibly an iron-rich core; it brought new insight into the formation of the terrestrial planets. Pioneer 11 spacecraft during checkout with a mockup of the launch vehicle's third stage, before launch. 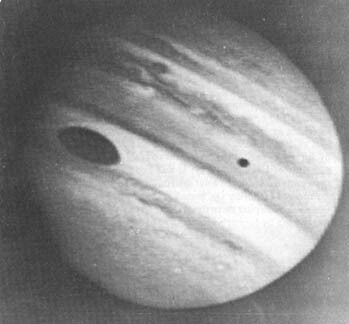 Jupiter's red spot and a shadow of the moon Io with the planet's cloud structure were photographed by Pioneer 10 on 1 December 1973. 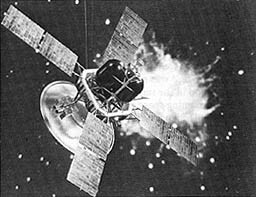 The first series of Pioneer spacecraft was flown between 1958 and 1960. Pioneer 1, 2, and 5 were developed by Space Technology Laboratories, Inc., and were launched for NASA by AFBMD. Pioneer 3 and 4 were developed by the Jet Propulsion Laboratory and launched for NASA by ABMA. 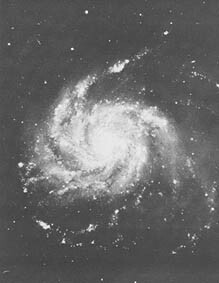 In 1960 Pioneer transmitted the first solar flare data and established a communications distance record of 36.2 million kilometers. With the launch of Pioneer 6 (Pioneer A in the new series) in December 1965, NASA resumed the probes to complement interplanetary data acquired by Mariner probes. 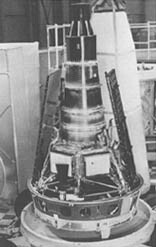 Pioneer 7, 8, and 9, second-generation spacecraft  launched between 1966 and 1968, continued the investigation of the interplanetary medium. Pioneer 10 (Pioneer F), launched in March 1972, became the first spacecraft to cross the Asteroid Belt. It flew by Jupiter in December 1973, returning more than 300 closeup photos of the planet and its inner moons as well as data on its complex magnetic field and its atmosphere. Accelerated by Jupiter's gravity, the probe was to reach the orbit of Saturn in 1976 and the orbit of Uranus in 1979; it was expected to become in 1987 the first spacecraft to escape the solar system. Pioneer 11 (Pioneer G), launched in April 1973, crossed the Asteroid Belt, skimmed by Jupiter three times closer to the planet than Pioneer 10 had, and was thrown by Jupiter's gravity toward Saturn. The spacecraft sent back the first photos of Jupiter's poles and information on the atmosphere, the equator regions, and the moon Callisto. On the night of 2 December 1974, when Pioneer 11 set its new course for Saturn, NASA renamed the probe Pioneer Saturn. 5 It was to pass close by Saturn in the fall of 1979. Ranger 7 before 28 July 1964 launch to the Moon, at left. 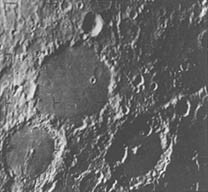 The television picture of craters on the lunar surface was taken by Ranger 9 before impact 24 March 1965. The first U.S. spacecraft to hit the moon was Ranger 4, launched 23 April 1962. Ranger 7, 8, and 9 flown 1964-1965, provided thousands of close-up photographs of the moon before crashing on its surface. They were the first of the unmanned space probes- Surveyor and Lunar Orbiter were later ones- to provide vital planning information about the lunar surface for the Apollo manned lunar landing program. The Surveyor spacecraft, designed to make a softlanding on the moon. 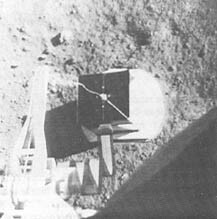 Surveyor 5's alpha-backscattering instrument, in the lower photo, analyzed chemical composition of the lunar surface after the 10 September 1967 landing. SURVEYOR. "Surveyor" was chosen in May 1960 to designate an advanced spacecraft series to explore and analyze the moon's surface. The designation was in keeping with the policy of naming lunar probes after "land exploration activities" established under the Cortright system of naming space probes.1 Following the Ranger photographic lunar hardlanders, Surveyor probes marked an important advance in space technology: a softlanding on the moon's surface to survey it with television cameras and analyze its characteristics using scientific instruments. Viking spacecraft model in simulated flight. 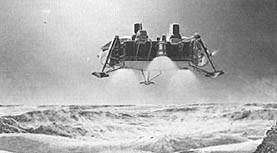 An artist's conception of the Viking Mars lander nearing touchdown on the Martian surface at Chryse. The parachute in the left background carries the aeroshell from which the lander detaches. ....canceled in 1968, the Viking program was to send two unmanned spacecraft-each consisting of an orbiter and lander-to make detailed scientific measurements of the Martian surface, and search for indications of life forms. *** The two Viking spacecraft, planned for launch in 1975 on Titan III-Centaur launch vehicles, were to reach Mars in 1976. 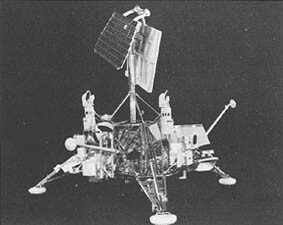 The name had been suggested by Walter Jacobowski in the Planetary Programs Office at NASA Headquarters and discussed at a management review held at Langley Research Center in November 1968.1 It was the consensus at the meeting that "Viking" was a suitable name in that it reflected the spirit of nautical exploration in the same manner as "Mariner," according to the Cortright system of naming space probes.2 The name was subsequently sent to the NASA Project Designation Committee and approved. * Mariner H was designated Mariner 8 by NASA Associate Administrator John E. Naugle because of pressure from the press for easier identification. This designation was a departure from past precedent of assigning a number to spacecraft only after a successful launch. (NASA, Mariner Mars 1971 Project Office, telephone interview, 4 June 1971). ** Viking has been previously used in the U.S. as the name for the early single-stage sounding rocket that later became the prototype for the first stage of the Vanguard launch vehicle. See Milton W. Rosen, The Viking Rocket Story (London: Faber and Faber, 1956) and Constance McL. Green and Milton Lomask, Vanguard-A History, NASA SP-4202 (Washington: NASA, 1970). *** Project Voyager was terminated because of the projected high cost of the program ($2.4 billion), which was related to the planned use of Saturn V launch vehicles.